One way to answer the question is to compare the struggle with Alice Paul’s (1885–1977) strategy here in the US. Paul also escalated the suffrage campaign, albeit with nonviolent tactics that ruled out property destruction. She cut her teeth in the British movement, but then, back in this country, made a different strategic choice, which raises questions about a tactic that some U.S. activists still look upon with favor. The time was right. By 1908, the WSPU could mobilize 60,000 people for a nonviolent invasion of the Houses of Parliament. A reinforced police line held them back. That same year, the American Alice Paul was studying at a Quaker college in Birmingham, England. She plunged into the WSPU. Beaten by police, her seven arrests led to three imprisonments. The WSPU began its most controversial escalation by smashing windows and a wall of the Parliament building. After Parliament failed to extend suffrage in 1910, the WSPU channeled anger and disappointment by blowing up governmental postal boxes and starting fires in a building in Regent’s Park, and the orchid house in Kew Gardens. Pankhurst expected the resulting polarization of opinion, but thought it would pay off by increasing the government’s sense of crisis. Alice Paul returned to the United States in 1910 with fellow-American Lucy Burns (1879–1966). They joined the National American Woman Suffrage Association (NAWSA) as leaders of its Congressional Committee, and were later to form the National Woman’s Party. NAWSA had confined itself to lobbying and petitioning. Its strategy of winning suffrage state-by-state seemed to Paul to be moving at a glacial pace. In every campaign, the choice of target was critical. Paul used her graduate study at the University of Pennsylvania to think through a shift in target: from state to the federal government. In the meantime she worked in Philadelphia’s woman suffrage scene and got women to stand on a box on the sidewalk to address startled pedestrians. In our Internet era, it is tempting for activists in one country to copy-cat actions that are gaining publicity elsewhere, without asking how conditions in their own city or country are similar and different to the place in the spotlight. That happened with Occupy Wall Street, for example, taking the occupation in Cairo’s Tahrir Square as something to emulate, then finding that the rigidity of the basic form (“Hold the space!”) prevented the flexibility that a successful movement needs to grow organically under quite different conditions. 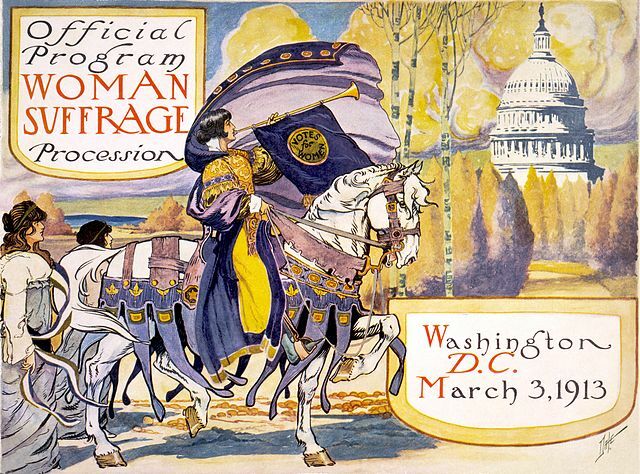 With the support of NAWSA, Paul organized a Woman’s Suffrage Parade in Washington in January 1913 — the day before Woodrow Wilson’s presidential inauguration. You can watch a fictional portrayal of the near-riot that resulted, in the excellent HBO movie, Iron Jawed Angels, starring Hilary Swank as Alice Paul. Except for a made-up love interest for Alice Paul, the film follows the narrative of the campaign in a remarkably accurate way. The thousands of women marching that day and the abuse they endured brought into the spotlight their demand for a suffrage amendment to the U.S. Constitution. Alice Paul and Lucy Burns concluded that the country was ready for a direct action campaign targeting President Wilson and the Democratic majority in Congress. Their gradual but edgy tactics led to a split with NAWSA and the founding of the National Woman’s Party. By December 1916, they had a full-fledged direct action campaign. Like their sisters in Britain, they disrupted (including a banner-hanging in the U.S. Senate) and picketed (the first group to picket the White House). Civil disobedience was central. By the time of their victory, one of their members, Julia Emory, had been arrested 34 times. They used the tactic of jail-in: When the police began to arrest them, they recruited more women to picket and refuse to pay fines, in that way taxing the limited jail facilities. And once in jail, they often refused to work and went on hunger strikes. Emmeline Pankhurst suspended the WSPU’s campaign in 1914 when Britain entered World War I. When in 1917 the United States entered the war, U.S. groups were pressured to support the war effort, but Alice Paul refused. Instead, she escalated, challenging Woodrow Wilson to become as enthusiastic about democracy at home as he was in his pro-war rhetoric for action abroad. In front of the White House, women held signs calling their president the title of the enemy Germany’s emperor: “Kaiser Wilson!” When infuriated men beat up the women, the police looked the other way. Police reportedly arrested some men who intervened to try to protect the women from the punching and kicking attackers. Some members of the Woman’s Party resigned in protest against Paul’s lack of patriotism, but other women joined the campaign, angered by Wilson’s hypocrisy. They publicly burned the president’s speeches whenever he invoked “the American obligation to stand up for democracy.” Jail sentences became longer. Finally, the president relented and, even though the war continued, urged Congress to pass the amendment. The debate was contentious and only after the war, on August 18, 1920, did Congress finally ratify the Nineteenth Amendment to the United States Constitution. The Woman’s Party had relied on a strategy of escalation just as much as WSPU. Each knew that society would initially polarize, with some allies and even members distancing themselves from the cause in the short run. (Much later in the United States, we saw during the civil rights movement this dynamic again: first polarization, then growth of support for the campaigners.) Significantly, Alice Paul even when intensifying the escalation in 1917 used nonviolent tactics instead of property destruction. The Woman’s Party ended its direct action when Congress passed the amendment in 1919. From start to finish, the direct actionists in the United States campaigned for six years. The WSPU had the advantage of larger numbers of women ready to do direct action. Halfway through their campaign they were able to assemble 60,000 women to try to invade Parliament, a far larger number than the Woman’s Party membership grew to in the United States. That’s quite remarkable when you consider how much smaller Britain is. Furthermore, it has no written constitution needing at times the lengthy process of amendment. The WSPU campaign started in 1903 and ended in 1914 – 11 years in duration, five years more than that of the Woman’s Party. When we look at escalation, whose goal is to accelerate victory, the comparison is even starker. The Woman’s Party’s nonviolent direct action intensified in the final two years and led to the passage of the Nineteenth Amendment. Before suspending the campaign, the WSPU used property destruction for its final six years. It’s hard to disagree with those British historians who believe that WSPU’s use of property destruction was sadly self-defeating. In Britain and the United States, I don’t expect a shift in the emotionally-laden meaning of property destruction to happen any time soon. In the meantime, let’s join Alice Paul, who knew that escalatory nonviolent tactics, resulting in suffering and initial polarization, leads to a paradoxical repression. During the repression was when the prominent figure mentioned above, Dudley Field Malone, joined the cause and argued the case for suffrage rights to President Wilson. He and others who joined the nonviolent fight correctly saw who was perpetrating the violence. What impeded the British movement, despite the moving heroism shown in Suffragette, was that they didn’t understand then what we can all see now: Choose nonviolent tactics for escalation if you want to ensure a greater chance of victory. EDITOR’S NOTE: George Lakey co-founded Earth Quaker Action Group, which won its five-year campaign to force a major U.S. bank to give up financing mountaintop removal coal mining. Along with college teaching he has led more than 1,500 nonviolence workshops on five continents, and nonviolence activist projects on local, national, and international levels. Among his many articles and books, he is the author most recently of Toward a Living Revolution: A Five-Stage Framework for Creating Radical Social Change, Eugene, OR: Wipf & Stock, 2016; and Viking Economics: How the Scandinavians Got It Right—And How We Can, Too, Brooklyn: Melville House, 2017. This article has been shared with wagingnonviolence.org, under a Creative Commons Attribution 4.0 International License.